OK … I am going to be honest. You deserve the truth. I believe you can handle it. Unlike Tom Cruise. 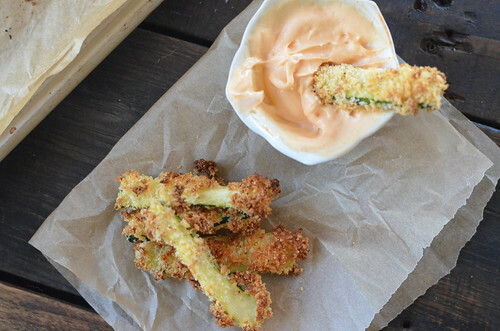 Zucchini Fries are not and will never be a replacement for the real thing. Ya know…french fries. Deep fried potatoes. Crispy. Hot. Salted. And dipped in mayo…is that just me? However, I am not trying to substitute deep fried potatoes with baked zucchini. Hell, that is just mean. And impossible. 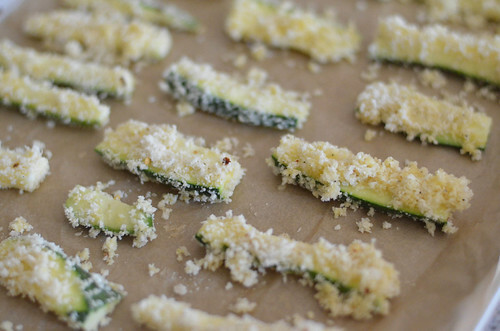 The only resemblance between french and zucchini fries is their similar shape. Sticks. Maybe I should have called them zucchini sticks. But then I think of trees – and they totally don’t taste like a tree, maple or otherwise. Or wedges – did someone mention shoes? Fries it is. But not fried. Baked. And not potatoes. Zucchini. But we went over that already. Each week I get a new bag of produce from my CSA (community supported agriculture) and each week I sort out what needs to be eaten right away (ripe fruit) and what can be placed in the hydrator and forgotten about for a while (zucchini). Honestly, when I found zucchini in my bag last week, I kinda sneered at them. OK, so I curled my lip (like Elvis) and growled. Don’t say you have never growled at a vegetable. Grrr…. What else can I do with zucchini? I have sautéed. I have roasted. I have frittered. I have steamed. I have made bread. I am (or was) officially zucchini-ed out. And yet, zucchini just keeps showing up. And now I have baked. Add it to my repertoire. 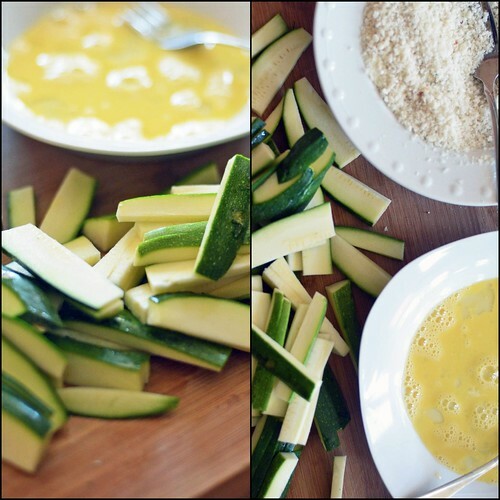 Anyone willing to share their favorite zucchini recipes…I have more zucchini in this weeks CSA bag. Oh, zucchini! Slice your zucchini. Whisk up a few eggs. Toss together panko bread crumbs, parmesan cheese, and spices. Panko (Japanese bread crumbs)…necessary. Set up a sort of dipping and coating station. Use only one hand…leaving one hand clean to answer that phone or send off a text message or scratch your nose…always thinking. Parchment paper lined baking sheet. Spread ’em out. Bake ’em up. Eat ’em up. And totally make sriracha mayo. Fries are just asking to be dipped. 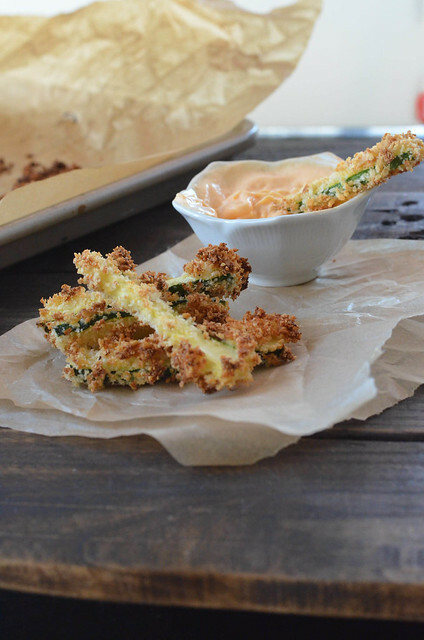 I have a feeling that zucchini fries will become a frequent dish this summer. Preheat oven to 425°F. Line baking sheet with parchment paper. Set aside. In a shallow dish (pie plates work well) combine panko bread crumbs, parmesan cheese, crushed red pepper, salt, and pepper. In a different shallow dish, lightly beat the eggs with a fork. 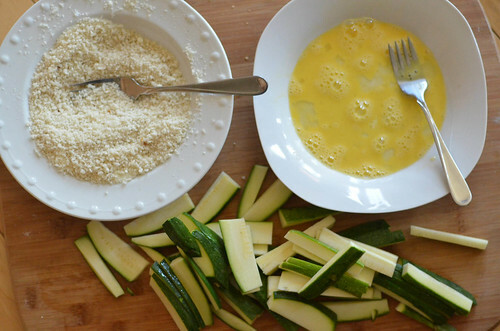 Dip each zucchini fry into the beaten egg and then transfer fry to panko bread crumb mixture, pressing to cover completely. Place fry onto prepared baking sheet. Do this with each fry until baking sheet is full. Place in preheated oven and bake for 20 to 25 minutes carefully turning fries half way through baking time. Fries should be golden brown and crunchy when done. Remove from oven and let cool until they can be handled. 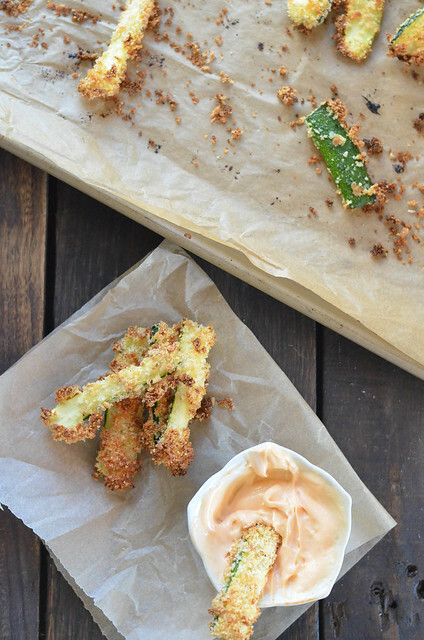 Serve with Sriracha Mayo. Mix together all ingredients and serve with fries.